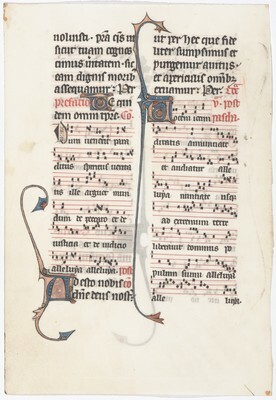 The leaf is from the third volume of a 3-volume Missal given to Beauvais Cathedral by a former canon, Robert de Hangest, shortly before his death on 3 November 1356 so that he would be commemorated every year on the date of his death. The Missal formed part of the Cathedral Library for several centuries until the Napoleonic period when the Missal and other works and relics were removed. While the first and second volumes have yet to surface, the third volume of the Missal (comprising 308 leaves) passed through several hands of ownership. In 1942 it was dismembered with a portion sold to Otto F. Ege. He contributed 42 leaves to specimen sets he compiled and marketed as "Fifty Original Leaves from Medieval Manuscripts". The Missal leaves are listed as no. 15 of the 50 chosen exemplars. This leaf came onto the market in 1981, sold by Maggs Bros, London, to the Friends of the Australian National University Library. Lisa Fagin Davis has reassembled surviving fragments of the Beauvais Missal as a test case of the Broken Books project under development at the Center for Digital Humanities at Saint Louis University. This leaf is the 111th surviving leaf to be identified, the first to be located as far removed as Australia. Contents: Written for use in the liturgy of Beauvais. Text with musical annotation (square musical notation on a 4-line stave) contains the Mass for the fourth Sunday after Easter (including the Credo, Offertory, Secret, Preface, Communion and Postcommunion) and the Introit of the Mass for the fifth Sunday after Easter. Decoration: Three 2-line and one 1-line initials ornamented in gold and colours (blue and pink) heightened with white penwork. The large initials have graceful long descenders with interlaced terminals and foliate extensions. Two 2-line initials with geometric penwork in black ink.